Manchester United have announced the signing of Paul Pogba from Juventus for a record-breaking fee of €110m. The French midfielder agreed to a five-year contract (with an option to extend for an extra year) and will be paid a salary of £290,000 / week for his services. 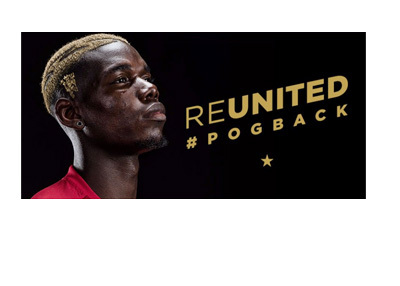 Pogba (23) left United for Juventus four years ago in search of more playing time. During his stay in Turin he helped Juve win four Serie A titles and two Italian Cups. He also helped them reach the Champions League final in 2015. The Pogba deal marks a successful transfer season at Manchester United whose recent signings have helped bring the club back into the football spotlight. With Jose Mourinho, Zlatan Ibrahimovic and Paul Pogba sharing the pitch week in week out there will most certainly be no shortage of juicy headlines. Pogba is expected to wear the number 6 shirt. All the best at United Paul Pogba!